Traditionally, nondestructive testing (NDT) of concrete refers to testing, inspecting, or evaluating concrete materials or components without damaging or destroying the serviceability of the structure or materials. 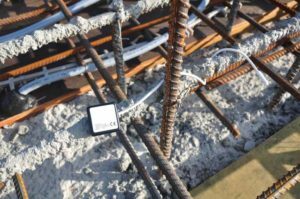 These tests have usually been performed on concrete structures that have been in service for some time, but present-day technology allows the use of nondestructive testing methods during the construction of new concrete elements as well. Some of the most popular nondestructive testing methods include the pullout, rebound hammer, and ultrasonic pulse velocity (UPV) tests, as well as the use of embedded temperature and maturity sensors for strength determinations. 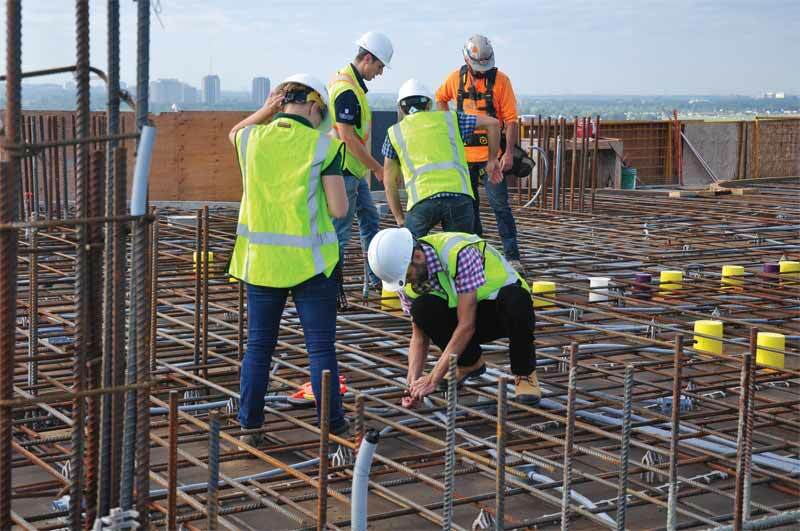 The tests’ purpose is to assess a multitude of properties (including concrete density, elastic modulus, compressive strength, reinforcement location, and surface absorption) affecting the integrity of concrete elements. NDT can be performed on old and new structures to verify the reliability and workmanship of concrete. The integrity of a building can be determined by monitoring concrete properties such as temperature and strength and detecting cracking, delamination, and the occurrence of corrosion, among other factors. NDT methods can be applied to assess and report on the condition of concrete at any stage of its life cycle, from the time it is placed to the time it needs to be replaced. Testing is primarily done to ensure the material and structure quality meets design needs, specifications, and building code requirements, ensuring the safety, welfare, and environmental protection of the community during the construction and occupancy of buildings. 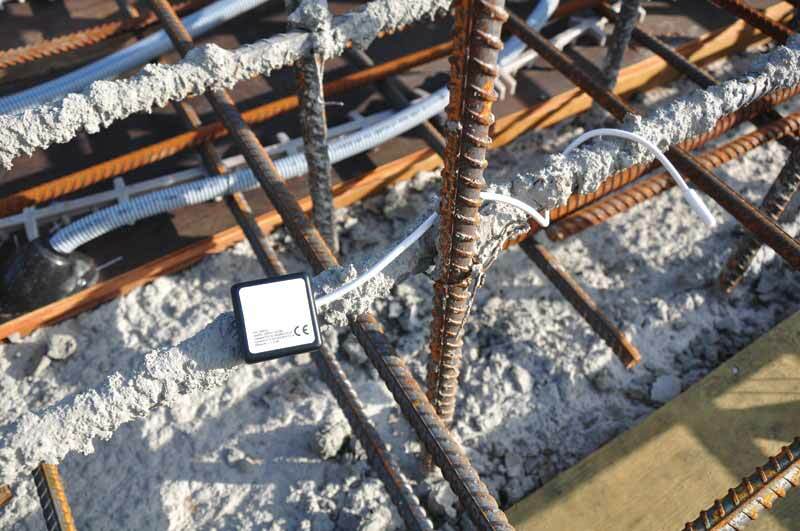 A wireless concrete temperature sensor installed on rebar prior to pour. 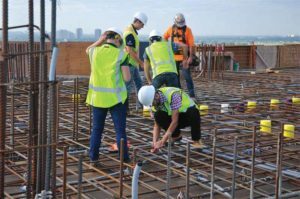 When it comes to testing during the placing of concrete, the most commonly used method for evaluating strength is the break test. These tests require concrete cylinders to be subjected to high amounts of pressure in order to assess the material’s compressive strength. Although this test method is said to be the most reliable, results found in the laboratory are often not representative of the in-situ cast concrete. This is due to various factors, including curing conditions, the size of the cylinders compared to the onsite concrete element, and transportation to the laboratory. (Transportation of concrete cylinders can often alter the integrity of the samples due to issues such as cracking and temperature changes.) Further, these tests tend to be less efficient as there is a delay in obtaining results, which in turn drastically increases project costs. Technological advancements have made it possible to obtain concrete strength data without preforming break tests. Various tools, techniques, and methods can be applied to nondestructively test the properties of curing concrete, such as the pullout, rebound hammer, and UPV test methods mentioned above. These advancements have also allowed for the development and use of embedded wireless sensors connected to the Internet of Things (IoT), a network of connected devices with the ability to transfer data with little to no human interaction. IoT sensors have the ability to gather and transfer information without physical connection or destruction of the concrete. The three non-IoT NDT methods are described in the following paragraphs. 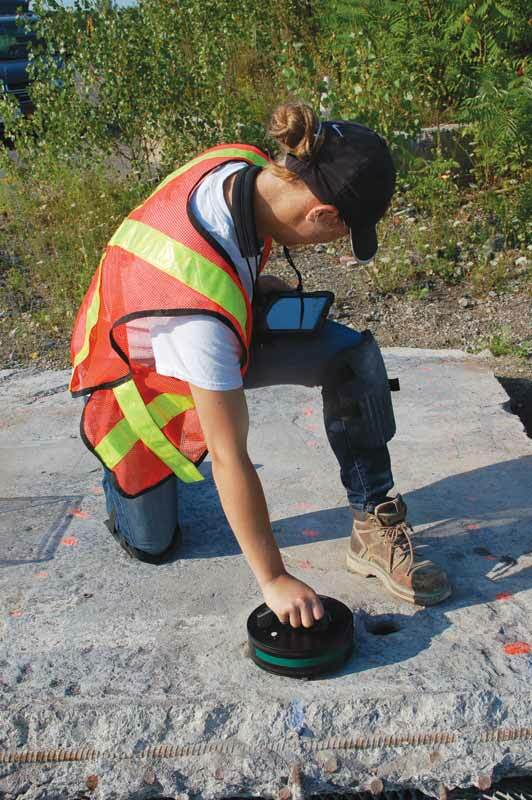 An engineer using a nondestructive, non-invasive corrosion detection device. The pullout test is invasive, but is still considered nondestructive as it does not affect the integrity of the concrete structure/element. It is used to determine the maximum force needed for an embedded metal insert containing an enlarged head to be pulled from a concrete specimen after being installed into hardened concrete or cast into fresh concrete. The force required to pull the insert out can be related to the compressive strength of the concrete. As described in ASTM C805, Standard Test Method for Rebound Number of Hardened Concrete, the rebound hammer test involves deploying spring-controlled mass strikes of a hammer onto the surface of a concrete element and measuring the rebound value, which varies depending on the hardness of the curing concrete. The rebound value is then used to determine the compressive strength of the in-situ concrete. UPV tests are described in ASTM C597, Standard Test Method for Pulse Velocity Through Concrete. They consist of setting two transducers against the surface of the concrete being tested and sending ultrasonic waves from one transducer to the other. In this test, it is the travelling time of the ultrasonic wave that is measured and used to obtain the ultrasonic pulse velocity, which then relates to the compressive strength of the concrete. Typically, a higher speed means a higher quality of concrete in regards to homogeneity, density, and uniformity. While these methods are often more economical than destructive break tests when it comes to cost and time required for testing, they also tend to be less reliable, as they are greatly influenced by the condition of local materials. For example, the type and volume of aggregates, moisture content, and curing process of the concrete could alter the pulse velocity. Research shows with compressive strength testing, rebound hammer test results can display more than 20 per cent error when compared to results obtained from traditional destructive testing methods (This statistic is derived from Y. Shih, K. Lin, and C. Chen’s “Improving Nondestructive Concrete Strength Tests Using Support Vector Machines, published in Materials in 2015.). Test results have also shown estimations become more accurate when multiple different NDT methods are combined. Embedded sensors offer a significant advantage as well.